The identity of a law firm can be construed rather easily based on the way they manage their documents. 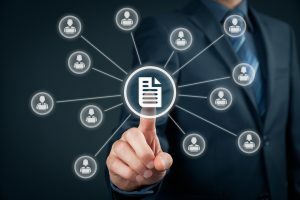 With so many files and records that a typical law firm must keep up with, the efficiency of their practice is directly correlated with how well their documents are managed. Document management systems have come a long way thanks to technological advances. Some of their key features are now crucial for any modern-day law firm to keep up with the demands of the every-changing world of legal practice. A well-functioning legal practice usually entails that they also have a well-functioning document management system. Effective document management systems offer the user a simple way to use, save, access, and organize their documents. This allows for a quicker way find documents, based on how the organization is set up. These features can be customized to fit into any law practice’s model. On top of convenience, an effective document management system also includes a blanket of security for the organization. Different levels of access and standardization are available to be set for different users. A low level employee can be restricted access to confidential or sensitive documents. There are also surveillance features that will monitor which documents were accessed by certain staff and the time of access. All these security features can help in the event of an audit or data breach. Compliance to required retention laws of documents can also be organized in such a fashion that any records reaching their maturity date can immediately be disposed, saving liability issues and space in the office. Legal document management systems are available through local providers with Record Nations. Legal document scanning services can save your practice money, reduce the physical storage capacities needed at your location, and give your entire office a streamlined approach to accessing and finding legal documents. Other document management systems, including electronic document management systems, can be implemented and can work with your pre-existing business software. Record Nations is a nationwide service that brings you free, no-obligation quotes from multiple document management system providers. We work with local companies based all around the country to find you relevant, affordable, and secure records management systems. In just minutes, you can be connected with free quotes. Once you receive the quotes, you can choose between them to find which suits your business operations best. To get started, fill out the form on the right or give us a call at (866) 385-3706.